Left to right: Ability NB Board member Pat Guest, volunteer Catriona Woodworth & Ability NB Rehabilitation Counsellor Christiane Blacquière. Catriona Woodworth – Our Volunteer Award of Excellence is awarded annually to an individual or group who demonstrates outstanding initiative and leadership in their volunteer work with Ability NB. The recipient of the 2011-2012 award is Catriona Woodworth. Catriona is a kind, hard-working and dedicated volunteer. Catriona has volunteered with Ability NB events for several years and she began volunteering Monday and Wednesday mornings on a regular basis in an office support position in January 2012. Catriona is always eager to provide support to staff. Whether it is organizing files, proof reading, researching, preparing surveys or helping with a mail out, she is always willing to take on new roles. Catriona is an incredible volunteer and we were pleased to present her with this Volunteer Award of Excellence. Left to right: Ability NB Rehabilitation Counsellor Jodie deSolla; ambassador of the year Sarah Lord and Ability NB Vice-President Mike McAloon. 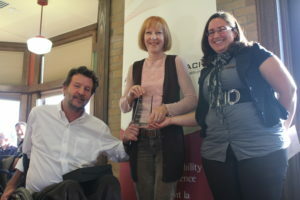 Sarah Lord – Our Ambassador of the Year Award is awarded annually to a person affiliated with Ability NB who has been a strong ambassador for our organization, spinal cord injury and/or disABILITY issues. The recipient of the 2011-2012 award is Sarah Lord. Whether it is starring in our PX2® youth video, being an ambassador on our Ability – Everybody’s do’in it campaign posters, or being the final Fredericton medal bearer for the Rick Hansen Relay, Sarah is continuously showing other youth with a mobility disability that anything is possible. Sarah believes in active involvement in her community. She was in her high school theatre productions in grade 10 and grade 12. She has volunteered with organizations such as the Dr. Everett Chalmers Hospital and Pine Grove Nursing Home. She has been actively involved in several sports such as shotput and basketball. In grade 11 she competed at track and field regionals and provincial for shot put and she is trying out for the 2015 Canada Games Wheelchair Basketball team. Her positivity and determination ensure she perseveres in anything that she sets her mind to and she is an incredible role model for others – youth and adults alike. Sarah recently began her first year at the University of New Brunswick in the Bachelor of Arts Program. Sarah is an incredible ambassador and we were pleased to present her with this Ambassador of the Year Award. Left to right: Wilf Torunski, Ability NB Board member; Eric Boucher & Courtenay Brennan, Para NB Coordinator. Para Sport & Recreation Award – Our new Para Sport & Recreation Award will be presented annually to an individual, group or organization that has made a significant contribution to para sport and recreation in New Brunswick in areas such as competition and achievement, program development, officiating or coaching. Our first recipient of this award is badminton coach, Eric Boucher. Eric, who is also a Canada Games Coach, was instrumental in our para badminton pilot where para badminton clinics were piloted throughout New Brunswick during the past 8 months. Six (6) clinics were held with 61 participants, including 27 persons with a disability. Eric’s dedication and adaptability to ensure that all individuals with a physical disability at the badminton clinics were playing to their full potential was exceptional. Eric also did demonstrations outside of his comfort zone using a wheelchair to demonstrate techniques. He is a talented coach and a leader in para coaching in New Brunswick. 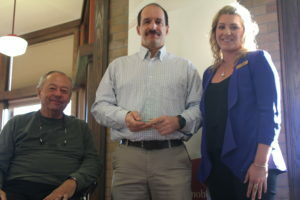 We were pleased to present Eric Boucher with our Para Sport & Recreation Award.